One of the most dynamic guards in the competition gave a parting gift to his home fans as DaShaun Wood led Alba Berlin to a come-from-behind win over Benetton Basket Treviso as o2 World on Tuesday. 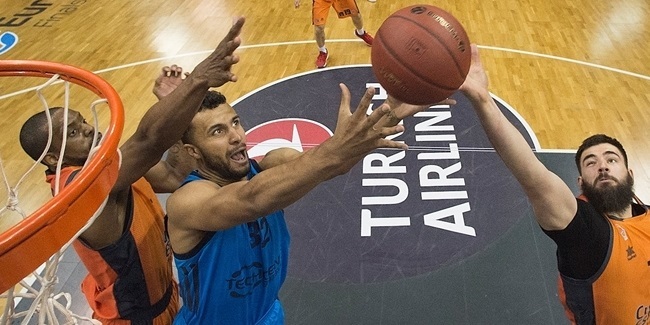 Wood was at his best for Berlin, which despite having already being mathematically eliminated from Eurocup quarterfinals contention produced a herculean effort for an 83-74 victory. Wood was at the center of it all with 22 points, 6 rebounds and 9 assists as he tallied a performance index rating of 37 to earn Last 16 Game 5 MVP honors. Berlin trailed 47-56 entering the fourth quarter; however Wood dominated the rest of the way with 15 points and 5 assists in the final stanza to spark Alba to its first win of the Last 16. 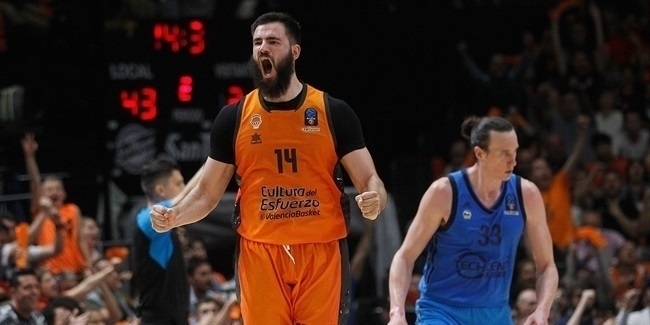 Wood’s impressive tally was the third-best individual effort of the Eurocup season behind only Regular Season Game 1 MVP Tony Parker of Asvel Basket and Last 16 Game 3 MVP Nando De Colo of Valencia Basket, both of whom collected indexes of 40. The week’s second-best individual outing came from a player in the same Last 16 group, Jonas Valanciunas. The Lietuvos Rytas center matched season highs with 17 points, 10 rebounds and 3 blocks in addition to 3 assists as he posted an index of 33. Despite his brilliant game, Rytas lost at home 78-82 to Lokomotiv Kuban. Asvel Basket’s hot young scorer Edwin Jackson was third in the list of top performances for the week with 19 points, 5 assists and 3 steals for a 26 index in a 93-87 road loss at BC Donetsk. Rounding out the week’s best performances are Krka Nono Mesto guard Afik Nissim and Donetsk big man Darnel Jackson, both with index ratings of 24. Nissim scored 12 points in addition to 4 rebounds, 4 assists, 2 steals and 8 fouls drawn as Krka beat Banvit BK 78-73. Jackson posted 20 points with just 3 missed shots plus 4 rebounds and a block in the win over Asvel. The best scoring effort on Last 16 Game 5 came from Krka forward Jure Balazic, who peppered the nets for 23 points. The Last 16’s No. 1 scorer is Lokomotiv big man Ali Traore who is averaging 18 points per game after netting that same amount in Tuesday’s game. VEF Riga big man Donatas Zavackas was the week’s best rebounder with 11 boards in an overtime win over CEZ Nymburk. Valanciunas is the Last 16 leader with 9.8 rebounds per game. Wood’s 9 assists represented the most in any Last 16 Game 5 contest. Wood is now the full season assists leader with 5.8 per game, while De Colo is the Last 16 leader with 5.6 per game. There were eight players to register 3 steals in Last 16 Game 5. Among them were BCM Gravelines guard Andrew Albicy, whose 2.4 steals per game is tied for second in the Last 16, and Nymburk swingman Tre Simmons, whose 2 steals per game are sixth in the Last 16. Last 16 Game 4 MVP Hilton Armstrong of Asvel Basket rejected 4 shots to lead the competition in that category for the week. Armstrong is tied for second in the Last 16 with 1.6 blocks per game behind only Valanciunas with 2.2 per game. Valanciunas was joined by Lokomotiv power forward Massey (13 points, 10 rebounds) as the only players to register double doubles this week.